On three summer weekends the beautiful Mieczysław Porębski Library at the Museum of Contemporary Art MOCAK organises meetings with authors, literary and artistic workshops and engaging discussions about book-making. 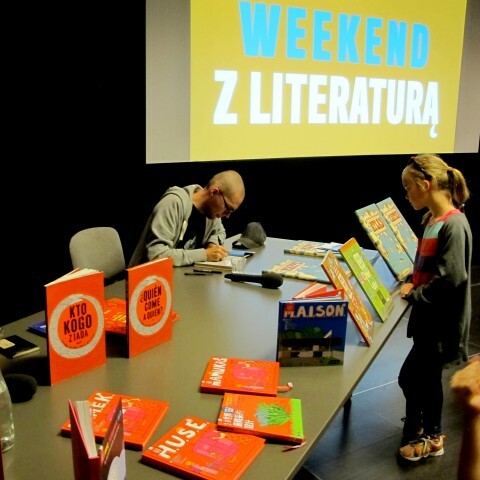 Organised in collaboration with Krakow UNESCO City of Literature, Summer Weekends with Literature project introduces participants to the fascinating and multifarious world of books. During the first meeting in June participants had the opportunity to take part in the meeting with Daniel Mizieliński, who with his wife Aleksandra makes them probably the most sought-after couple of children’s books authors (they created Maps, the most successful international publication of Polish literature in years – a delightfully illustrated atlas which has been translated into more than 20 languages!). In July, August and September MOCAK invites to games with Julian Tuwim’s Wiersze dla dzieci [Poems for Children], a visit to the Museum’s library with writers and philosophers and a special book-swap, Drugie Życie Książki [Second Life of a Book].